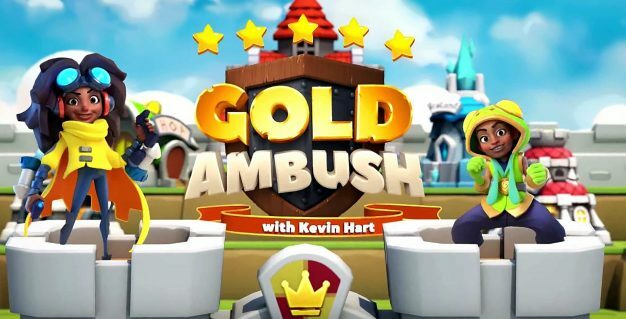 Kevin Hart releases Gold Ambush – get that gold! Alright, alright, alright! Just earlier this month, Kevin Hart had begun his full partnership with StandUp Digital. He has also announced the release of Gold Ambush with Kevin Hart. The free-to-start game is now available in the App Store with micro-transactions. Originally, Gold Ambush had been without Hart. It is StandUp Digital’s first major release this summer. Mutual connections brought Pinxter Digital and PolyPlay in conjunction with each other. Together, they cooked up the new mobile gaming powerhouse they named StandUp Digital. It is something we would have seen coming in any case. With Pinxter’s personality associations and PolyPlay’s innovative game mechanics, it became quite the recipe. Gold Ambush with Kevin Hart is a vision brought to life. This is made possible through transforming celebrity and brand participation through gaming. Nearly two-thirds of the population in America are smartphone users. These devices are the crucial way into the online world. Of course, the game isn’t at all limited to the US. However, Kevin Hart did gain his stardom in said country. So it’s only reasonable to expect that it’s the best location to start up in. Pinxter believes that mobile apps incorporate the pivotal gateway in order to link consumers to brand experiences. By teaming up with PolyPlay, the audience are certain that StandUp Digital is in safe hands. This will be due to the quality of apps they release. Prior to this, PolyPlay has created and released games such as Hex and Will Hero which makes an impressive portfolio. This includes Gold Ambush. StandUp Digital isn’t stopping there as it aims to establish an entire mobile gaming empire. What has Kevin Hart been up to beforehand? Having sold out an entire football stadium and Madison Square Garden due to his rise to fame, Kevin Hart is recognised everywhere. His comedic reputation continues to grow immensely. It was only a matter of time that he tried out his luck in the gaming side of entertainment. He says this is a “completely different world that I’m now getting educated on.” Here’s hoping that Hart will be able to entertain fans virtually, with as much success as his stand-up. These types of gigs aren’t the only ones that Hart is all about, however. This year, he has starred in the movies Captain Underpants: The First Epic Movie and The Upside. This includes the upcoming film Jumanji: Welcome to the Jungle. In Hart’s stand-up, he is known for talking about his family. Therefore, it stands to reason for the game to feature himself, his wife Eniko, and their kids Heaven and Hendrix. And they will all be present as playable characters. The game mechanics consist of city-building strategy components and maze-running gameplay combined. The player is able to lay traps and raid other cities for their own resources. This will make your own city stronger and richer. Pinxter highlights that there will be inside jokes thrown in the game. This will be from Hart’s previous and prominent stand-up performances. As an avid fan of Kevin Hart’s work, I am looking forward to the double entendres that I’ll be met with when I play this! Hart’s children love videogames and they are big on Minecraft and Mortal Kombat. This happens to be the inspiration that Hart needed to work with the game developers. This is because he wants to do something that his kids will appreciate. Ultimately, he hopes that other children of other parents will appreciate it, too. It’s gentle on roughness yet ambitious on Hart’s grin in caricature form. This is what the comedian is renowned for in the first place.